Sixteenth in the series... a picture for Ycehart's Eternal Forest. 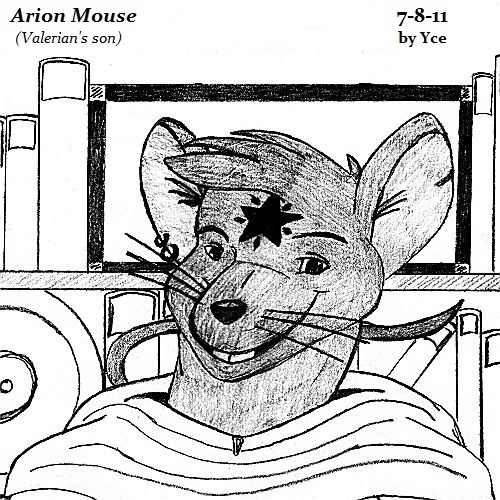 Arion Mouse is the son of arch mage Valerian Mouse although his abilities lie in another school of magic: sorcery. A dedicated student of the Star Crest Usagi Majo School, he is a cheerful and always smiling teenaged mouse who excels at magical research and making pizza. As a show of his dedication to his clan, he has the symbolic tattoo of the Star Crest clan imprinted on his forehead. You can expect a pizza party when Arion wants to entertain his friends.